We are taking a couple of much needed rest days at Bill's house. 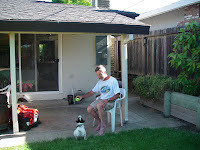 Jack is in heaven in Bill's yard with a tennis ball to play with and chase. Saturday was a very lazy rest day. Then in the evening we went to dinner with Pete and Susan (the kind friends who will pick up Bill on the other side of Nevada) and our old friend Joel. 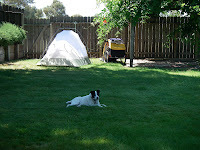 Today is a make and mend day as we get ready to head into the foothills of the Sierra tomorrow. We will be all packed tonight as we want an early departure tomorrow. We face 2000 feet of climbing to Placerville so we hope to get as much as possible done before the heat really gets going. 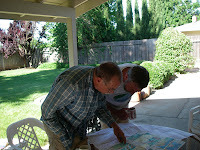 Dave and Bill have been poring over the maps and have figured out the best way to get to Carson Pass. So you're heading for the hills. Two thousand feet of climbing, huh? I hear Placerville has some great brew pubs. That should keep you motivated. Beer is definitely a motivating force in bicycle touring. On Thursday (100+ degrees), the thought of a cold beer was definitely on my mind for several miles. Vaya con cerveza! high fokes jim robertson maryjanes husband here. we spent last weekend at tahoe with dona and robert then went through kid carson pass to pioneer to see there cousin virginia we were hoping to see you fokes comming through pass but missed you. very bautiful place. will check on you again have fun.